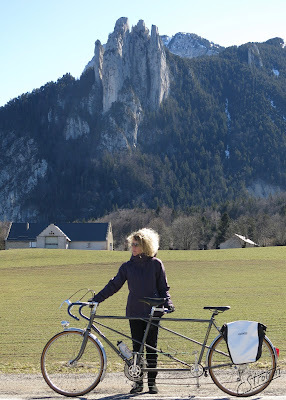 Since our first tandem experience and some memorable rides in the Vercors and Chartreuse mountains with a rental from Métrovélo in Grenoble last summer we were hooked. 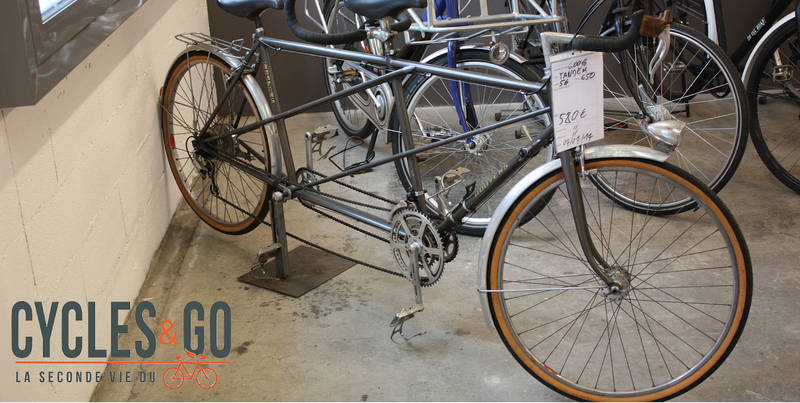 Already during our holiday we scoured the internet for an affordable used bike made for two. We managed to locate a nice Peugeot TM8 Ladyback in Hannover that we picked up while still on our way home. 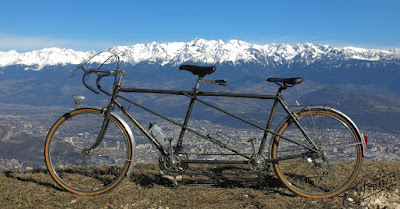 Tandem Routens sur fond de Grenoble et la chaine de Belledonne. longue. Photo par Cycles & Go. Le velo dans le 'magasin' Cycles & Go à Fontaine. 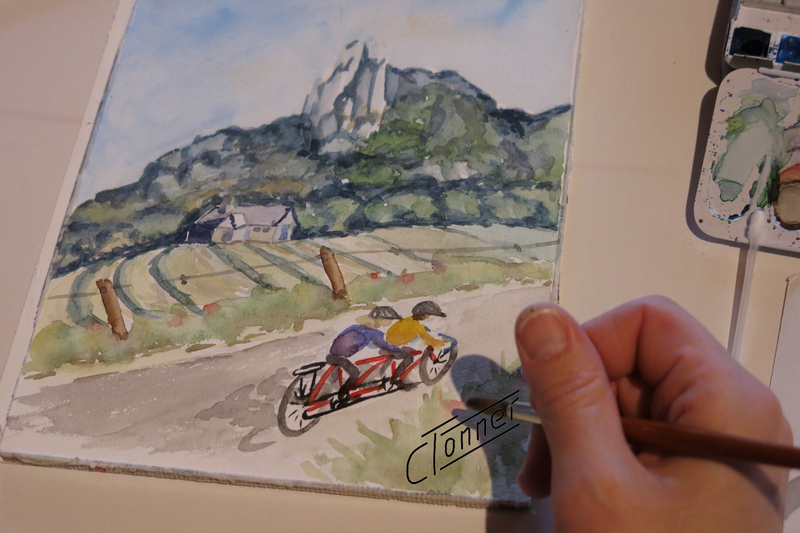 Photo par Cycles & Go. ... and were lucky. After my first visit, Cycles & Go were kind enough to reserve the bike, replace some damaged components, and change the rear cassette from 14-26 to 14-28. 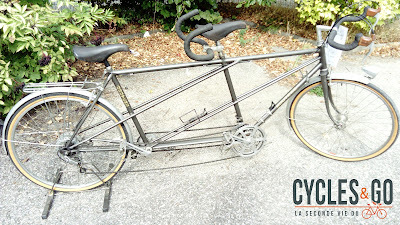 They agreed to keep the bike for a while until we definitively could take possession of it during our next holiday in the region, and I was able to recover a few parts for restoration. cotton Tressostar protégée par 4 couches de vernis shellac clair. cables du frein tambour et le frein M.A.F.A.C. arrière. We had decided, that the handlebars, seat-posts and saddles needed some adjustement for a proper fit and a bit of attention for better looks. 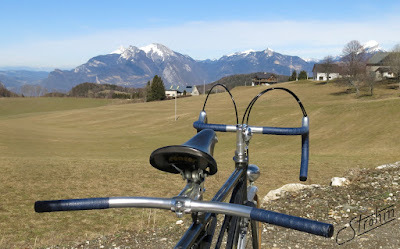 Clear shellaced tressostar cotton bar tape, a hole in the stem for the front brake cable, T.A. style diy cable guide, and a shiny Crane bell definitely improved the overall appearance. Tandem Routens sur fond de Chartreuse. 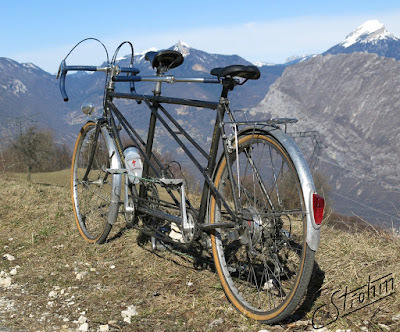 Re- mounting the parts, and the first few small excursions in the foothills of Belledonne and on the plateau du Vercors confirmed both, a nice a ride, but also that a second french tandem meant opening another can of worms. 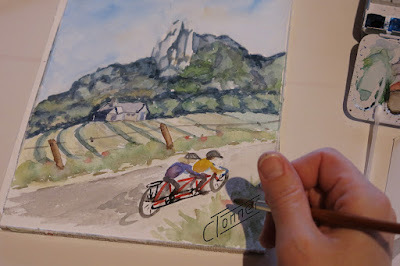 That said, I have to admit that I actually do enjoy the hours spent in the workshop understanding 'french bicycle idiosyncrasies' combined with the particularities of tandem components when the weather does not allow any outside activity. pour contrôler la vitesse dans des longues descentes frequentes dans la region. Eclairage 'vintage' Cibié, Soubitez, Cibié. 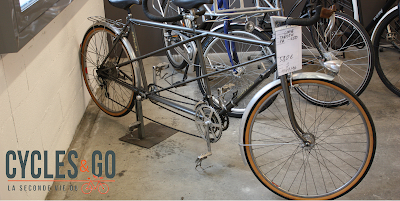 The bicycle is equipped with a range of nice french components: MAFAC brake levers, MAFAC Racer front and rear brakes mounted on braze-ons, Specialités T.A. tandem crankset, JPR pedals, Huret derailleurs, Maxi-Car tandem front hub, Maxi-Car drum brake in the rear, Mavic and Super Champion rims, JPR handlebar, aluminum fenders, Cibié lights. Sur le plateau du Vercors, vue sur la Moucherolle. But despite the nice looks, Routens decals, and being partially equipped with what used to be high end components - there is some nagging doubt about the frame: the presence of JPR components places the bike in the era of Jean-Paul (rather than Jo) Routens, the fork resembles a Peugeot or Motobecane tandem fork at least as well as the ones with the famous biplane crowns, and the finish of the seat stays and twin laterals reminds the bike boom tandems more than a fine custom frame. At least some of the tubes are seamed, and with close to 23 kg, the bicycle is overall a bit on the heavy side. Could it be that the frame was subcontracted, and the bike 'only' assembled by Cycles Routens? 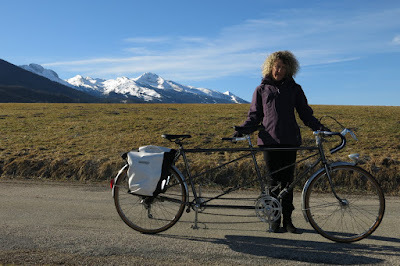 In the end, this observation doesn't take anything away from our enjoyment, and we decided right away to take the bike on tour at the next best occasion - but this is another story. Quand il pleut dehors nous voyageons dans les souvenirs. 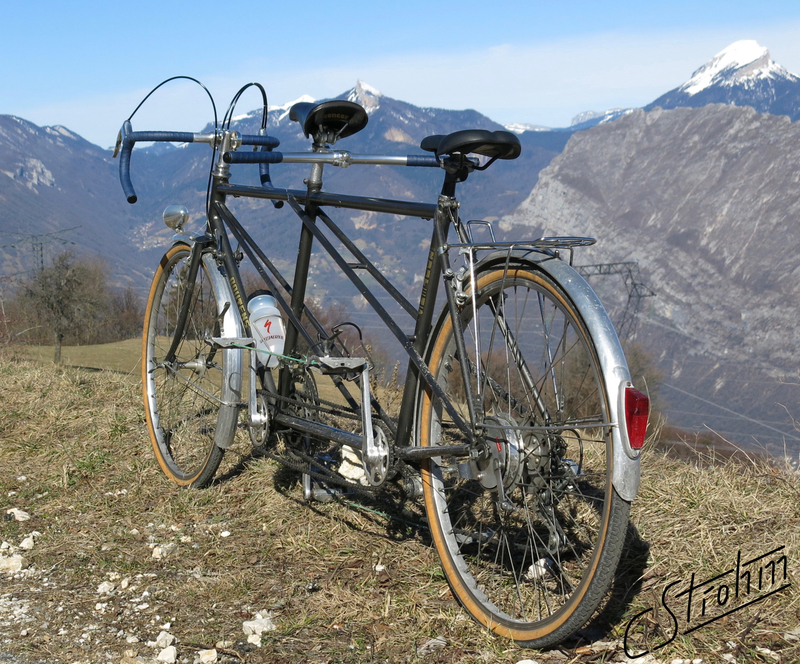 Around Grenoble 'Cycles Routens' is still a household name and while tandems rarely fail to prompt cheerful comments, its even nicer to hear an "Oh! Le joli Routens ..." and to engage in a short conversation about beautiful bikes made in the region.